The recent paper in Nature of Frank et al on CO2 feedback has had a run in the blogosphere. That was started by a review in Science Daily. Briefly, the paper says that the minor feedback mechanism by which warming causes CO2 to be expelled from the oceans, causing more warming, is less than some recent estimates. The key figure is the increase of CO2 in ppmv resulting from 1C warming, and Frank et al give a median figure of 7.7, with a range from 1.7 to 21.4. That seems quite within the range Frank et al find. Yet people who suggest some pillar of AGW has fallen say that recent estimates were up to 40 ppmv/C. Lubos Motl had cited that figure, so I put the IPCC figure to him. He cited this 2006 paper by Scheffer, Brovkin and Cox as the source of the 40 ppmv/C claim. we arrive at an estimated carbon sensitivity (α) to temperature of 41 (following Mann and Jones) to 12 (following Moberg et al) ppmv CO2°C. A rather ambivalent figure to be refuting. Update Fri Jan 29 2.56 pm (East Aust Time) Big Oops. Programming error. It is surprising that such a simple program could have a programming error. But there was a memory overflow, and it had a big effect on the results. With that corrected, there is indeed a rise in station mean temps. The new graph is here. I should emphasise that the plot is of "naive" means - just averaging all readings for each year, including duplicates. The new plot is like that on p 14 of the d'Aleo/Watts report, and different from that on p 11. 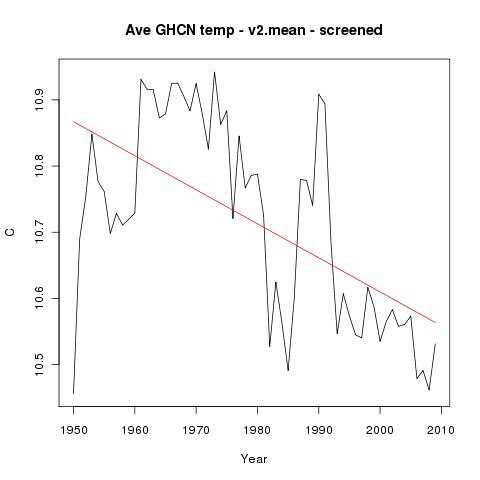 The new report of d'Aleo and Watts, trumpeting calculations of E.M.Smith, makes much of a supposed shift of GHCN stations to warmer areas as an alleged source of warming. Indeed, it is full of accusations that this is done with fraudulent intent. 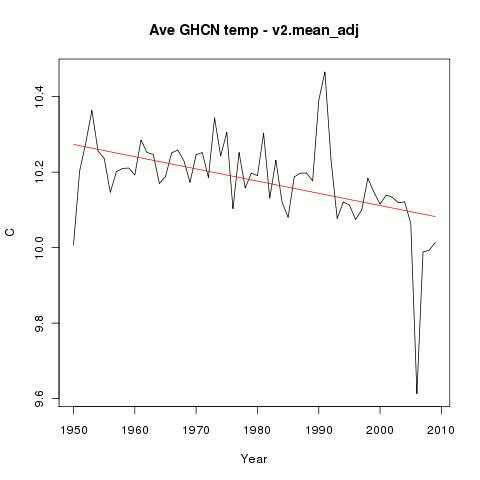 Of course, anomaly calculations wouldn't show warming for that reason. But is the station set actually warming? I did a simple calculation. Just the average temperature of all stations in the GHCN set v2.mean, for any year. You might expect a small rise reflecting global warming. But if there is nett movement of stations to warmer climes, that should show as a bigger effect. Here's the result, plotted from 1950. The trend is actually down. Update 29 Jan. I investigated the downspike about 2006. It's caused by some stations returning a lot of missing months, which yields erratic results. So I put a screen in the program requiring at least 9 months of data before a station could contribute to the year's average. It didn't change the overall picture, but did eliminate the spike at 2006. Following a suggestion of Carrot Eater, I checked the v2.mean adjusted file. The results, not very different, are here . 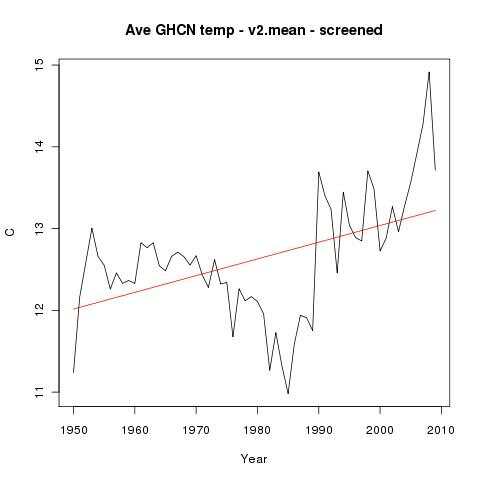 WUWT has featured Marc Sheppard's American Thinker article, which gives a prominent place to E.M.Smith's claims about how GHCN has been selectively dropping cool stations to boost apparent global warming. I was going to blog extensively on this, but I see that Real Climate. and more completely Zeke Hausfather have it well covered. However, maybe there's a bit to add to the WUWT discussion. First some elementary things which people like Smith and Sheppard really should check before going into this stuff. All climate trend work is done in terms of temperature anomalies. For each station a base average for each month is established over some base period (1961-1990 for GHCN). For each month, the anomaly is the difference between the average for the month and the base average. So the base average takes out the effect of location, and just reports whether, for that station, the temp was higher or lower than "usual". This is vital in establishing a regional or global average - otherwise you really do have to worry about whether you have a fair distribution of hot and cold places. That is hard, and its why you'll see few references to a global temp in deg C.
So selectively dropping cool stations would not at all make global anomaly bigger or smaller. The other elementary step is to enquire why the stations were discontinued. The NOAA explains their station selection thinking here. Zeke expands in his post. The bottom line is that GHCN was a historic database. It could include many more stations because it had years to process the data. But once you start trying to maintain such a database in real time, it's much harder. Data doesn't come preprocessed and checked down the wire from much of the world. A lot comes in print, and has to be digitised. You need to rather carefully work out just how much you need. That's why NOAA did not try to keep up many of the stations that contributed to the historic network. The basic study of the independence of anomalies from local topography etc was Hansen and Lebedeff (1987). It showed that over a period of time, anomalies correlated well over distances up to 1200 km and more, without taking account of long term average temp. That means that you can indeed select representative sites without trying to balance this factor. I'm still not convinced by E.M.Smith's claim that discontinued stations are cooler. But suppose they are. Does it make a difference? Zeke says no. 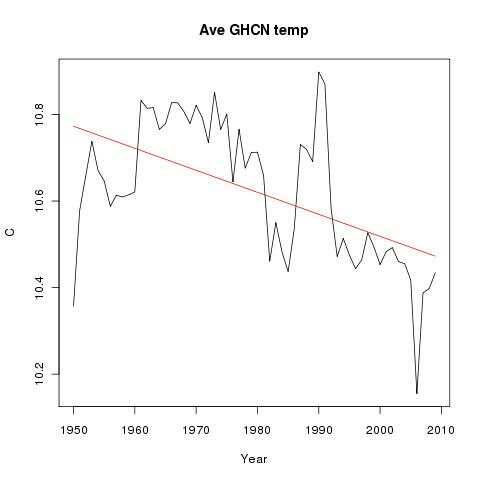 Here's his plot, showing that if you take stations currently reporting, and compare with stations that have a long record in the GHCN database but do not currently report, then there is no real warming or cooling effect. A good range of altitudes there. The Dist is distance from Sucre. Arica is by the sea (desert); others are inland. The anomalies show some variation, but they are all pretty warm, as the red patch suggests. No reason to expect Bolivia to be different. What if there were no Greenhouse Effect? Roy Spencer recently put up a post on his blog, reposted at WUWT, on the old chestnut of "What would the world be like without the greenhouse effect?". His thesis: "there would be no weather on Earth without the greenhouse effect." That, and some other things he wrote, are wrong. "So, let’s imagine an extremely cold Earth and atmosphere, without any water vapor, carbon dioxide, methane or any other greenhouse gases – and with no surface water to evaporate and create atmospheric water vapor, either." That's a big change, but let's go with that. The Earth's atmosphere is often described as a big heat engine, generating weather. It is. A heat engine creates motion from transferring heat from a hot source to a cool sink. Sunlight creates lots of differential heating - between regions of different albedo, different latitudes, and between night and day regions. The latitude difference creates the classic Hadley cell. Hot air in the tropics rises from the surface, moves polewards, and descends in mid-latitudes, warming the cooler surface there. The warm source is maintained by an excess of sunlight over IR loss, and the cool sink is maintained by a corresponding deficit. This happens independently of the greenhouse effect. The Hadley cell combines with the Coriolis effect to yield trade winds (the part of the cell where the replacement air flows back, cooled, from mid-latitude to tropics, and the mid-latitude westerlies (roaring forties), produced by the angular momentum transported from the tropics. Lots of weather there, and not due to the GHE. Roy says "[without GHE]...Only the surface and a shallow layer of air next to the surface would go through a day-night cycle of heating and cooling. The rest of the atmosphere would be at approximately the same temperature as the average surface temperature. And without a falloff of temperature with height in the atmosphere of at least 10 deg. C per kilometer, all atmospheric convection would stop." This is a common misunderstanding of the dry adiabatic lapse rate. It is not related to upper air cooling due to GHG emission. It happens in any gas (eg pure N2) which is in motion in a gravity field (g=9.8 m/s^2). It is something a like a reverse Carnot cycle. Imagine that you had a balloon with 1 kg gas (say N2), in an isothermal atmosphere under gravity, and you perform the following cycle. 1. From an initially isothermal state, you raise it rapidly by 1 km. The air expands adiabatically and cools (by 9.8 K). Because it is denser than the surrounding air, work is done to raise it. 2. The balloon is then held still until it warms to the ambient temperature, absorbing heat from the high altitude. It expands further, doing wasted work displacing gas. 3. The balloon is then quickly lowered 1 km. It is compressed, becoming hotter than ambient (by 9.8K), so work is needed to pull it down. 4. Again, the balloon is allowed to cool to ambient, delivering heat to the lower altitude. The cycle can repeat. This is a classic heat pump. You do work, and move a fixed amount of heat downward in each cycle. Actually, in this case work is not required, because source and sink are at the same temperature, and the work is wasted. But the process can also be carried out with any lapse rate up to the dry adiabat of 9.6 K/km, and then true heat pumping is done, and heat goes from cooler to warmer. The cycle has neutral effect if there is already a lapse rate (negative temperature gradient) of 9.8 K/km. For then the gas in the balloon is always at ambient temperature. It requires no work to raise it, and transfers no heat on arrival. You might worry about whether there is some effect due to the external air being displaced up or down. OK, just imagine there are two balloons, one lowered just as the other is raised, so then there is no nett displacement of the atmosphere. This is how the dry adiabatic lapse rate is maintained. Atmospheric motions, driven by the above mentioned heat engine, do the work. Whenever the gradient is less than the dry adiabat, heat is drawn downwards, until it is restored - well, almost (see next section). 3. Latent heat transport - can be larger again. But it requires that actual phase change occurs - evaporation and condensation, within the cycle. It enhances turbuleny transport, because the air carries more total heat. 4. Rosseland radiative transport. This is an enhanced thermal diffusion involving repeated absorption and emission of IR (by GHGs). It's often overlooked, and I'll talk more about it in a future post. The postulates of Roy S would remove the leakage mechanisms 3 and 4, actually reinforcing the dry adiabat. Roy says "And without a falloff of temperature with height in the atmosphere of at least 10 deg. C per kilometer, all atmospheric convection would stop.". And that's his error. It wouldn't stop - it just has to be driven, by the atmospheric heat engine, as it is now. And that heat engine just needs regions of different temperature, which there would certainly be, with or without the GHE. In fact, the main latitudinal driver would work in much the same way. So what would it be like? The conventional calculation is 33 C colder (for the same albedo), and that seems to me about right. There would still be latitude differences, and day/night differences, as well as land warm spots due to albedo variation. There would still be strong atmospheric motion - in fact the main circulations (eg Hadley) would still exist. The dry adiabatic lapse rate of 9.8 K/km would be almost universal. There would still be a tropopause somewhere, because at some altitude the atmospheric motions will reduce, the heat pump will fade, and heating from UV absorption by ozone etc will become more significant.